Jean Diaz is a filmmaker working on an animated feature that would speak out against violence, when he is suddenly killed in an accident. Diaz comes around after death only to face Death personified, who wants to strike a bargain with him. Chico: Zorro! He's alive! Zorro can never die! For us that grew up in the '70's... THIS was our Zorro film! It was kinda campy, but then again... so was Batman reruns. Watching it again now, it's hard to compare with films made nowdays, but I still enjoyed it. This time around I got the subtle jokes (Zorro sticks his foot in front of Garcia and says, "Have a nice trip"). 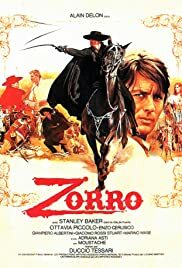 The common themes of Zorro are there - The freeing of the slave labor, the little boy that assists Zorro in slapping the soldiers around, the priest, the Diego character. Also all the familiar swordfighting cliches (i.e, the candle cut, the jump up on the table). I recently found this at Wal-Mart for $4.99, so I bought it not expecting much. From the moment I heard the silly Zorro theme song, I knew that this was the Zorro movie from my youth!